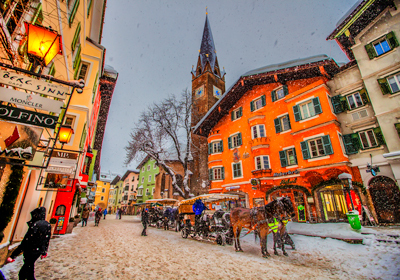 Kitzbuhel is one of Austria's most famous ski resorts, and the historic buildings, luxury shops and charming restaurants make it a favourite amongst skiers everywhere. The medieval centre of the resort has plenty of character, with cobbled streets and colourful buildings lining the main avenue through the village. This distinctive town boasts great skiing and a lively atmosphere. The resort is well known for its apres ski, and like Obergurgl the bars and restaurants are a little more sophisticated than in nearby St Anton. The resort is host to a number of international events including the FIS downhill and a four day polo competition. Whether you're looking for lively apres ski drinks at the Londoner or Flannigans, or a classier evening at the casino, Kitzbuhel has more than enough going on to keep you entertained. The surrounding countryside is picturesque, with thick forest on the mountains, and a number of stunning Alpine lakes. There are three airports with in two hours of the resort; Salzburg and Innsbruck are only 70 minutes away, while Munich is 1 hour 50 minutes. Home of one of the most famous FIS downhill runs of all time, the 'Streif', Kitzbuhel is well known for the quality of its skiing. With 173km of pistes right on the doorstep, and a further 280km in the nearby SkiWelt area, this is a superb choice for skiers of any ability level. There are 91km of blue runs in the area, offering good progression for improving skiers, as well as 57km of red runs and 25km of black runs. There is extensive snow cannon coverage across the ski area, ensuring that even the lower slopes have enough snow for a reliable season. The Hahnenkamm downhill race takes place each January, with almost 50,000 spectators arriving for the event each season. The Kitzbuhel Horn mountain's two half pipes, quarter pipe and sprint slalom course are popular amongst snowboarders and freestyle skiers. 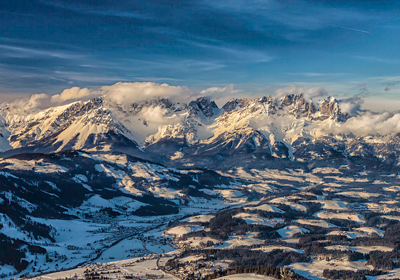 Kitzbuhel enjoys a 500km network of cross country trails, with a popular one day 'ski safari' route that is marked by an elephant sign and has a special guide available from the tourist office. There are over 50 fantastic mountain huts in the area, offering stunning views and good table service food. 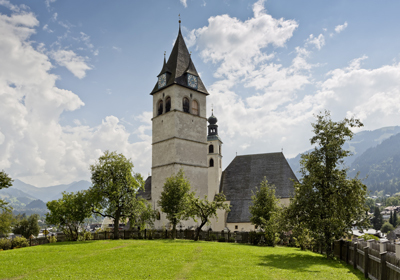 Kitzbuhel is a lively town, with a thriving summer season. The historic buildings, colourful shop fronts and stunning scenery make it a popular summer destination. The high Alpine lakes, warm temperatures and dramatic mountains provide a stunning backdrop to the hiking and cycling trails. There are 170km of walking trails open in the summer months, with 570km of cycling routes. The lifts are open in the summer months for those that don't fancy testing their endurance by cycling up the mountainside. As in most dual season Alpine resorts, paragliding is popular during summer. There are also a number of superb rock climbing and canyoning routes, with the Wilder Kaiser offering challenging climbs and stunning views over the valley. The Kitzbuhel region boasts some of the best golfing in Austria, and the traditional Kitzbuhel golf club offers sunny greens, spectacular scenery and some tricky golfing. The two island greens and old castle walls give it a distinct atmosphere, and its central location and impressive heritage have made it one of the best known clubs in the country. Kitzbuhel is one of a number of luxury Austrian resorts, and the bulk of the properties for sale in the resort are chalets rather than apartments. Those apartments that are for sale in the resort are largely second home status, with only a small number available as investments with rental management services. There are a number of new build and resale properties available in Kitzbuhel with both second home and investment opportunities available. Some of the resale chalets available are in superb locations right in the heart of town or in ski in, ski out positions, while many others sit in scenic, secluded locations slightly further from the slopes and the centre. Two of four apartments remain in this designer apartment development in a sunny SW-facing position located near the charming town of St Johann. 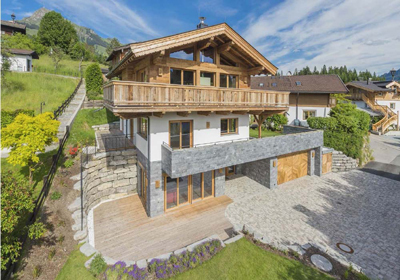 A luxurious chalet in the centre of Reith bei Kitzbuhel, complete with home cinema, private spa facilities and an outdoor pool. The Ellmau Residences are a new set of high quality apartments located just fifteen minutes from the world famous resort of Kitzbuhel. With Kitzbuhel just a few minutes' drive away, Chalet Leopold sits in one of the most picturesque positions in the resort, providing beautiful views over the mountains, valley and golf course.